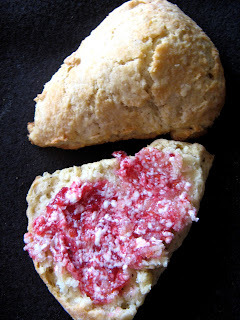 Nutmeg Scones with Cranberry Orange Butter – delicious breakfast idea for the holidays! You know by now I love cranberries. ( Hence the jam and pop tarts. ) 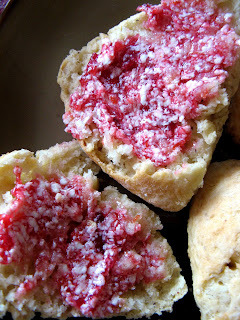 When I saw the recipe for a cranberry butter – I might have done my happy dance. 🙂 And that’s how a homemade butter lead me to bake something I have never baked before. ( Is it weird? ). I added nutmeg, as a spice we are enjoying this time of year. But feel free to add any spice you are favoring. 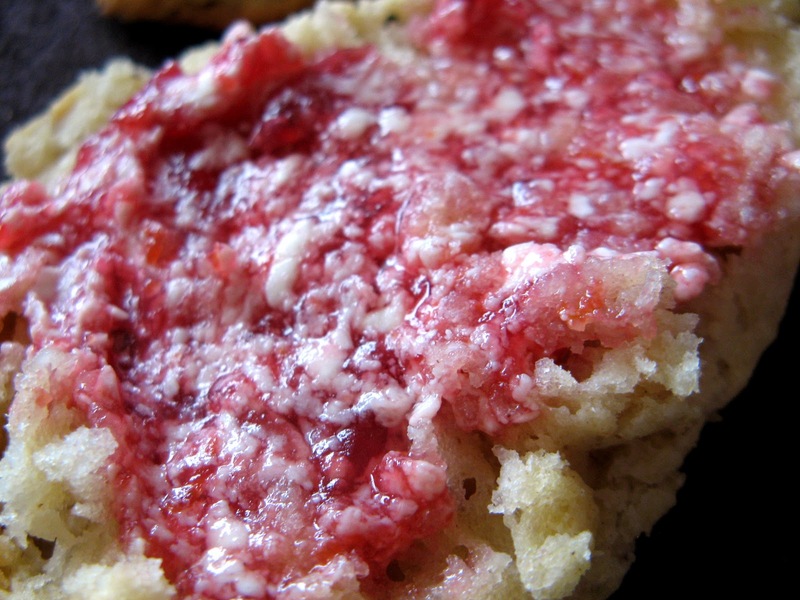 Soft and fluffy scones with nutmeg. Perfect served with cranberry orange butter. In a large mixing bowl, whisk all dry ingredients together ( flour, sugar, baking powder, soda, salt and nutmeg ). Add butter and cut it in using a pastry cutter. Add buttermilk and egg and stir gently until just combined. Place the dough onto a lightly floured surface, divide into two parts. Flatten each one into a disk, about 1/2 inch thick. Cut in half and then each piece in half again and again. You should have 8 scones. Place them all on a parchment paper-lined baking sheet. Repeat for the second disk. Now you should have 16 scones nicely placed on a baking sheet. Place the baking sheet into the refrigerator, preferably overnight, or at least 30 minutes. When ready, preheat the oven to 425 degrees. 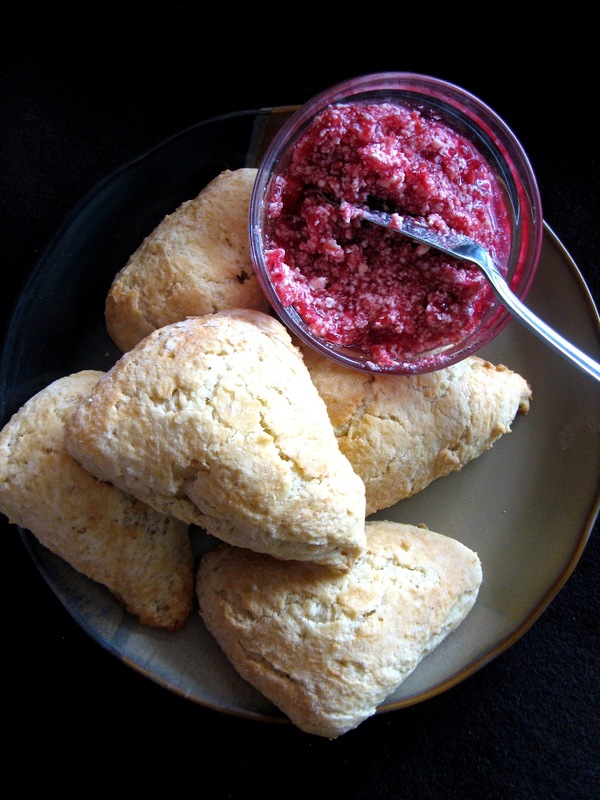 Bake the scones for 13 - 15 minutes for the 30-minute refrigerated ones, or 15 - 18 minutes for the overnight refrigerated ones. Cool on wire rack. Fluff the softened butter with a fork. Stir in the jam and orange zest. Add the powdered sugar and stir all until combined. Spread over freshly baked scones or refrigerate until you are ready to use it. Now let me rave about the butter for a moment. Oh, melt-y goodness! It’s full of flavor, it’s full of fragrance and makes you happy just watching it melt on your freshly baked goods. The flavor combination seems to be a match made in heaven! Baker’s heaven :). The taste of orange really comes through, unexpectedly really. You would think the cranberries would totally take over. You can see them in the butter. You take a bite and BAM! Orange! 🙂 I would recommend making my cranberry jam for this butter ( why wouldn’t I? It is the best jam ever! ) It has chunks of cranberries and that is the main flavor here after all. Simply put – you have to try it! The nut scones look fabulous with homemade cranberry butter. I wish you and yours a happy holiday season! Anna, what gorgeous scones…and perfect with your yummy cranberry butter! Dear Angie, thank you for the comment. Merry Christmas! Dear Lizzy, thank you! Happy Holidays! Hi Jay, thank you for stopping by! Following you back!